It has been rough lately. I’m working on compartmentalizing work stress, but it has been bleeding over and affecting training life. Tuesday night I got out for my hard workout of the week and felt pretty flat. I did 5 of the 7-8 intervals prescribed and called it a night. The rest of the week I felt like I was getting sick and prioritized rest and recovery and ended up doing absolutely nothing Wednesday through Friday. 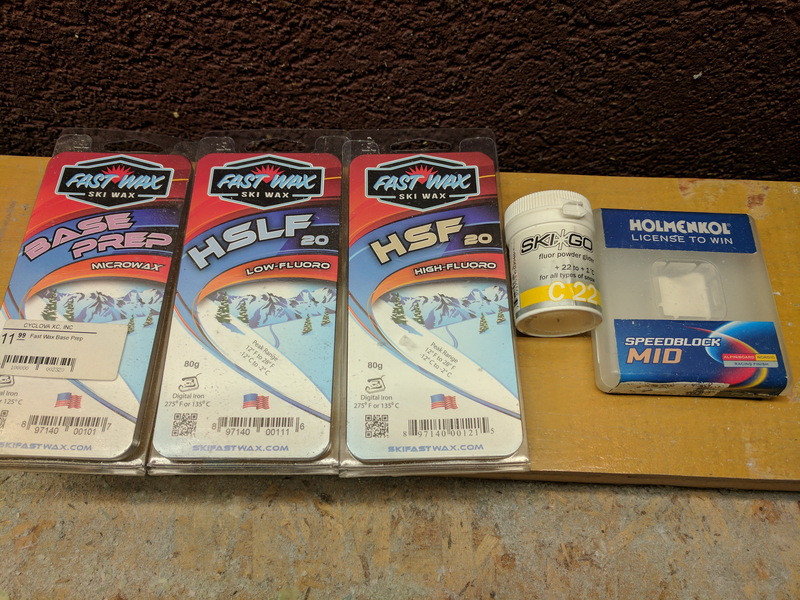 I went FastWax 20 underneath and SkiGo C22 for the top coat all on my nice soft warm Rossis. I’m still not sure I’m doing the powder top coats right. I need to have a hands on seminar with the experts. The temps I think ended up warmer than anticipated and the course was pretty “silky”. The SkiGo felt like a good call, I’m not sure if the 20 was the right base layer, but erring on the side of cold is usually the safer bet. 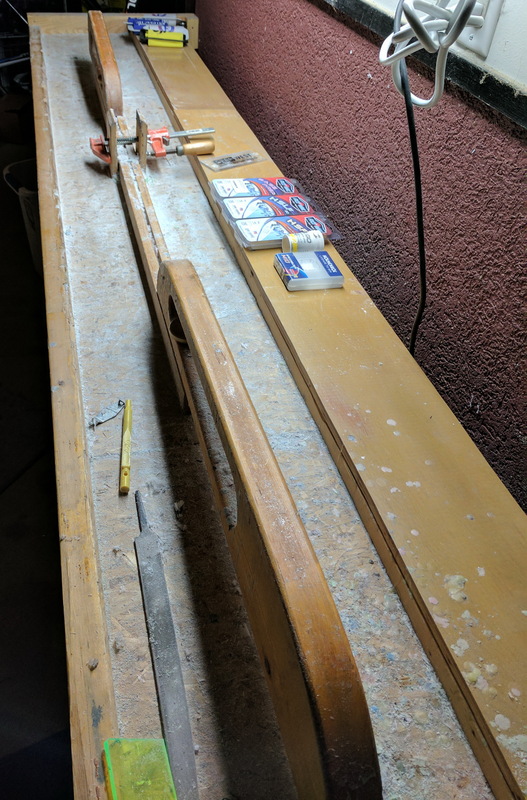 My skis felt pretty good all day. Drew Holbrook appeared to have rockets on which were clearly superior to the field. Mine felt competitive. 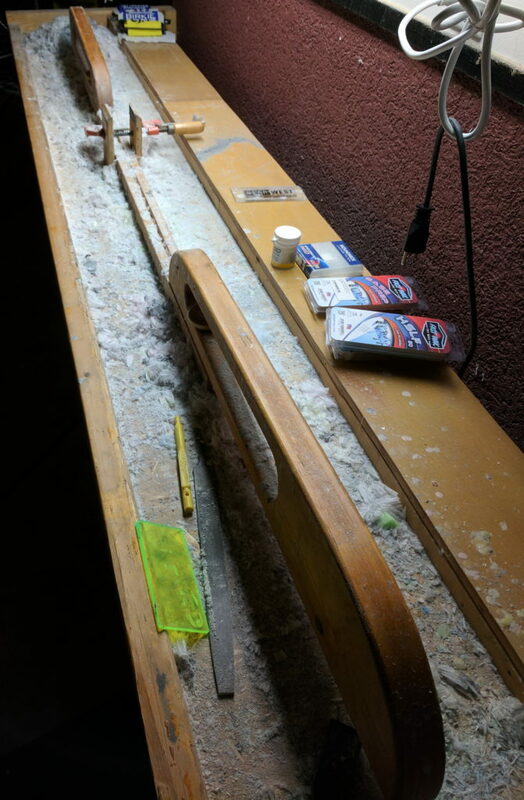 On a related note, I hadn’t cleaned my wax bench yet this year. I’m sure Frank is horrified. Hopefully Frank will sleep better after I cleaned it up. I’m not great at getting a good starting spot for the PreBirkie. It seems like every year I’m a few rows back from the line. This year I was in the fourth row right next to Big E and in front of Mike P. Looking around for “my competition” I saw Chris Halverson maybe a dozen columns to the left and on the front row. Since my week was kinda sad I wasn’t super pumped for the race and didn’t go in with a specific strategy. At this point I figured I would go with the flow on the lake and eventually find my groove. Not long after the start and we swung to the right to head down the lake I found myself right next to Chris Halverson. We skied a significant portion of SISU together and he flew past me at the Noque before I eventually pulled a little time back from him. I figured this would be a good place for me to fall in line. The field was big and the climb up from Duffy’s field was two wide and pretty solid front to back. I stuck to Chris like a shadow and we worked our way through the field. He kept a nice steady pace and I saw him frequently looking at his watch, presumably pacing by HR. I felt like I was pushing a bit to keep up with him, but at this point I really wanted to take the ride and push my limits. The Pre-Birkie has a net elevation gain of 300+ feet. My app calculates 1600′ of climbing compared to 1800′ for the full Birkie. Yeah, lots of climbing. Somewhere just after the Fish Hatchery I got caught up in a little traffic and I had to make a short burst to catch back up again. I could feel I was on the limit there. Unfortunately some where in there Elaine Nelson went by and Chris decided to take a ride himself. I knew that was too hot for me and fell back to ski with a group of 26k racers and Dan Gjertson. Dan has fantastic technique and super smooth pacing. After Mosquito Brook he was on the front and put in a fantastic pull on the front of the group. He basically led from there all the way past Gravel Pit. Never surging, but just a nice steady effort. The whole time Chris and Elaine were maybe 20-30 seconds up the trail. But by Gravel Pit the gap was shrinking and by somewhere not too far north of there our group caught them again. At that point I became Chris’ shadow again. 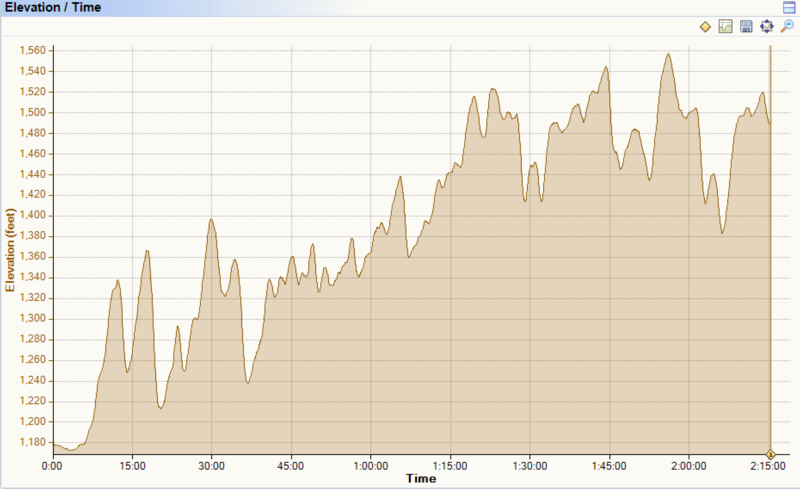 Annotated HR graph from the race. Nutritionally I was drinking steadily from my belt filled with Green Tea Buzz Tailwind. I also grabbed a glass of something at most of the aid stations to supplement. On the only major downhill between Gravel Pit and OO I grabbed the one gel I had pinned to my belt. I fell off the back a slight bit again trying to shove the wrapper back into my belt. I either need to find an easier way to do that or only eat at aid stations where I feel better about tossing the wrapper. Thankfully I was able to catch back on with the group without too much issue. Somewhere before Picnic Table Hill we picked up Drew Holbrook. He hopped in the group. By the time we reached the hill we had dropped one or two of the 26k skiers and we were rapidly gaining on a few more 42k skiers. I had been dreading Picnic Table Hill and the horrible feeling you get when you go past the short race cutoff to do the long race. Thankfully I was still feeling pretty dang good. I even told Chris that for once I wasn’t rethinking my choices in life. As we headed up to OO and through that aid station I think we passed Jon Miller, and picked up Rod Raymond, Jay Chesterman and another skier or two. The conditions north of OO were fantastic and we had a group of about 8 guys mostly following Elaine. I continued to feel strong enough through those first major climbs after OO headed north on the classic trail. By the time we were approaching the turn around north of Boedecker I could feel the fatigue starting to set in though. Just before the turn around Jordan Roby came up behind us saying on your left. At first I thought which joker in our group has been sitting in and suddenly wants to go faster. But he came out of no where and was moving well so of course he can go through. That broke the group up a bit though. He went up the trail and so did Elaine and another skier. I remained in a group with Chris and Jay. Drew, Rod, and a few others had strung out the back somewhere. I’m not sure what Jordan was doing at the start of the race, but when he wanted to go in the latter half, he sure went. I felt surprisingly good climbing back up to Boedecker on our way south. My legs started to feel a little crampy, but no signs of bonking yet. After the Boedecker aid station Jay decided it was time to make a move and took off up the trail after Jordan and Elaine. Chris made a little move to chase him but Jay’s break was good. I started to have a few doubts about hanging with Chris and started to yo-yo a bit. I pulled myself together mentally though and got back in his shadow and hung on for dear life. Through this stretch we also gobbled up a few other fading skiers including Craig Rudd. By the bottom of the OO climb I figured it was time to dump what I had left on the trail. I took the inside, slightly steeper line, and just got to work on my V1. I didn’t really surge but just put out a high steady effort. 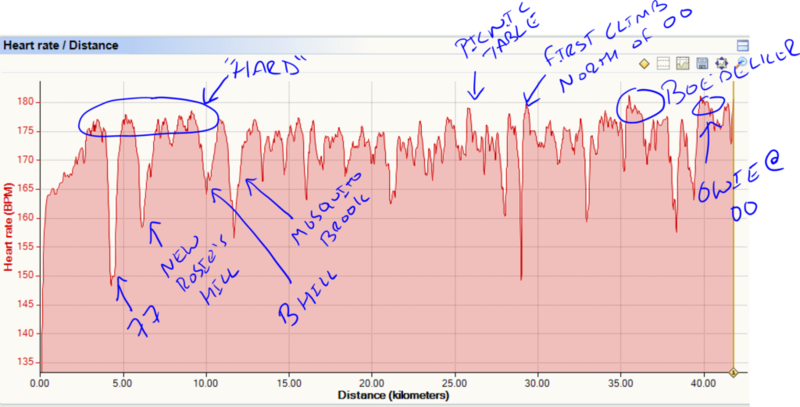 As we hit the flatter spot before the final climb I put in a few hard V2 skates and then climbed the last of the hill. As we rolled through the field on the north side of OO I had a small gap and kept the effort high to not let Chris close it down again. Crossing OO in the soft snow, with on coming skiers, and then the little climb back up into the Korte start area hurt pretty bad. Chris was holding steady if not closing a little though so I just held my V2 and tried to keep the effort as high as I could. As we rounded the last corner to head north on the original skate trail I dumped what I had left in to gain some speed on the mostly downhill run to the finish. A quick look over my shoulder showed me that I had finally broken away enough that I was probably safe to the finish. Despite that I managed a nice sprint up the last little hill and through the finishing straight. I’m pretty stoked with my race. From start to finish I think I held the kind of effort I wanted to hold. At no point did I actually blow up nor did I fade at the end. I really credit those people I skied behind for setting great steady efforts. Chris led me for probably 30+ km of the race. I felt a little bad for sitting in until 1.5km to go and then dropping him, but it definitely helped me. Without even looking at the detailed results, I know I was in the kind of company I want to be in. I finished in front of half a dozen elite wave skiers and right in the mix with a bunch of others. For the most part, these elite wave skiers are the super consistent skiers from year to year, so even if some of them are off a little from past years, the territory they ski in is still very good. For once, the objective data agrees with my subjective analysis, so we can share a little more detail. 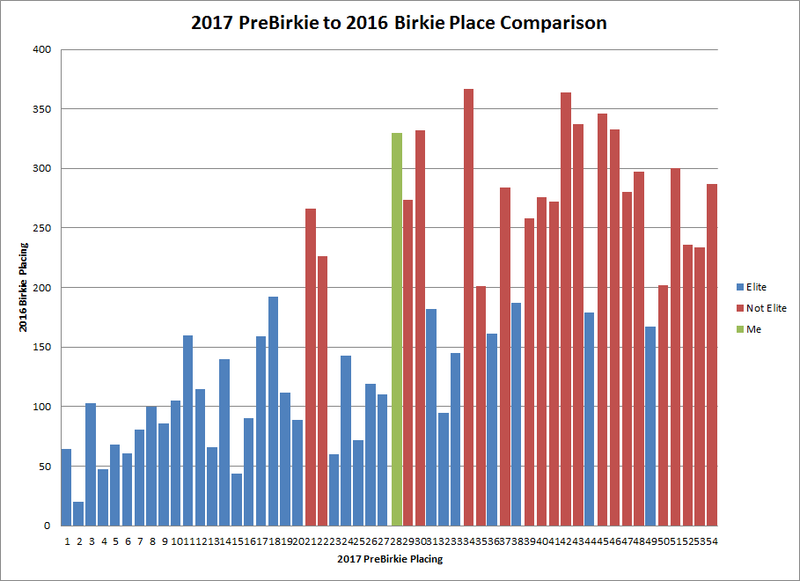 Bar chart of 2016 Birkie results from the 2017 PreBerkie. Blue’s are elite wave skiers, red, not, me in green. As you can see, the PreBirkie brings out plenty of big guns. What I like seeing here is that there are still a good handful of blue lines after me. 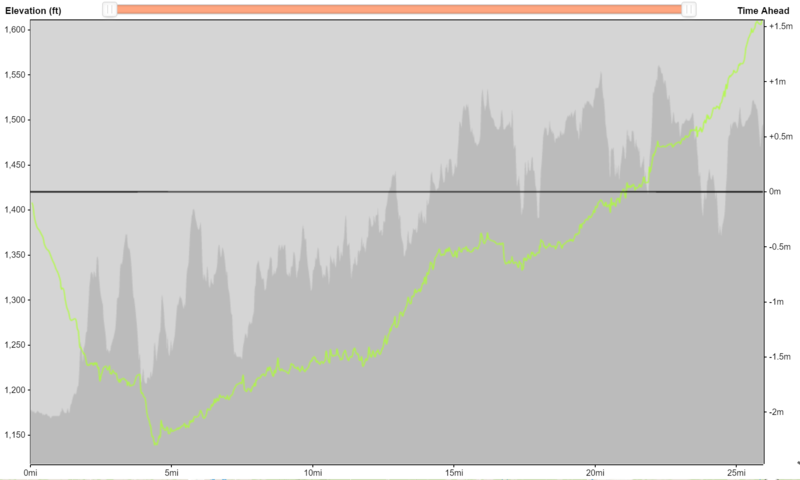 There are also a good group of borderline elite wavers back there too in the 200-300 place last year range. This tells me I’m skiing with the right folks if I want to be in contention this year. The normal correlation of PreBirkie to Birkie results. The further above the line the better the PreBirkie was relative to the Birkie. 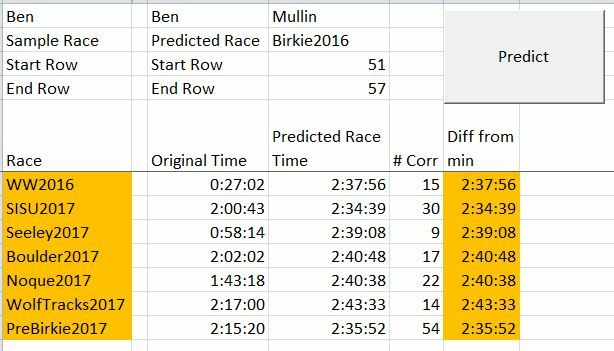 Last we have the correlation summary chart that shows the predicted Birkie time. According to this, SISU was ever so slightly better. I think beginning to end this one was better, but who’s going to argue the data? Thinking really cold thoughts. The weather is definitely frightful and I’m worried what that will mean for the big race. I’m sure Ben Popp and the entire Birkie Crew are losing a lot of sleep. I have confidence that they will pull off what ever is possible given the circumstances. This weekend I’ll either do a short race or try to find some snow somewhere (or eek, roller ski) a nice 25k time trial (who knows, the Birkie might only be 25k). And thinking about my bike. Ski season is a bummer so I’ll be excited to hop on two wheels again soon.